Disclosure: We were guests of LEGOLAND for purposes of this review. As always, all opinions are my own. Growing up, my two sisters and I were really into dolls. Of course, we had Legos, but they weren’t the big deal that they are now. There weren’t so many amazing choices—at least not for us. Meanwhile, my husband growing up loved Legos. He built all the Star Wars Legos and whatever else he could get his hands on. He would have loved to visit LEGOLAND as a kid, if only it had existed. So when our son Harry grew old enough to start using regular Legos, my husband found his own childhood again. He and Harry love building. That’s their thing. We also love the Lego Movie. And at 4 years old, Harry already builds Lego sets for 6-year-olds because he works on them with his dad. For those reasons, when it came time to plan our trip to California, my husband was emphatic: “We’re going to Legoland.” The park didn’t exist when he was a kid, so he was really excited to go! 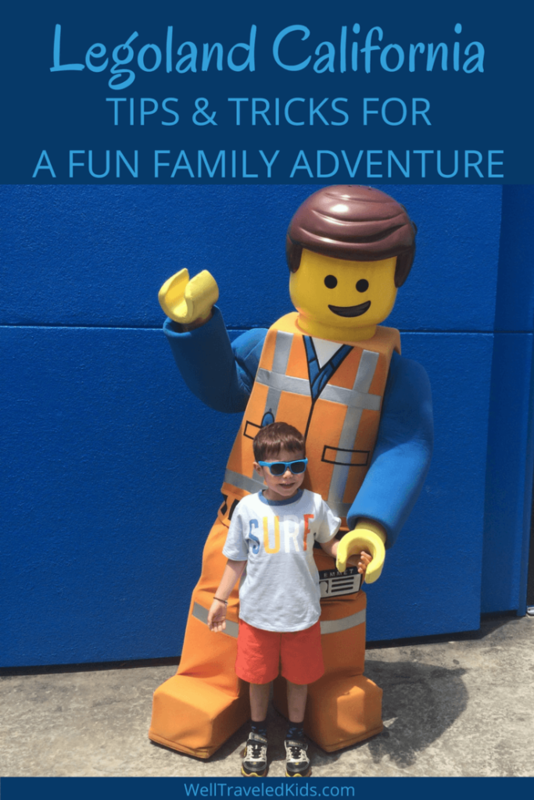 We had a blast on our LEGOLAND California vacation, and learned some great tips & tricks for visiting that we’ve shared with lots of friends! Make a family event of it. We invited family friends as well as my husband’s parents, and surprised them with the reunion. 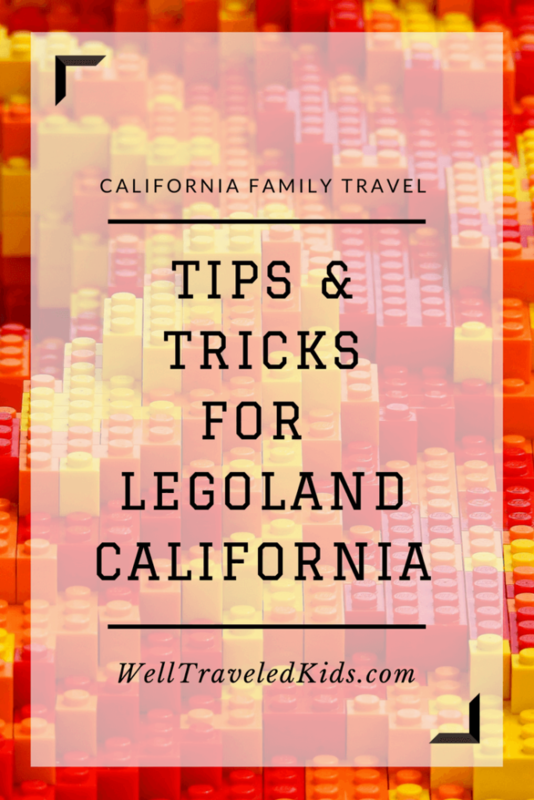 The spirit of Legoland is fun and light-hearted, and the location in Carlsbad, California is a great jumping off point to explore all that this beautiful, southern coastline has to offer. If your kid is as into Legos as ours is, make sure to pack a Lego mini-figure. You can trade them all over the park with other kids and park workers. You can also buy more mini-figures in the Legoland store, but the fun is in the trades. Make sure you have a camera. Whether you use your camera phone or a separate camera, be sure to pack something that can help you save the memories. 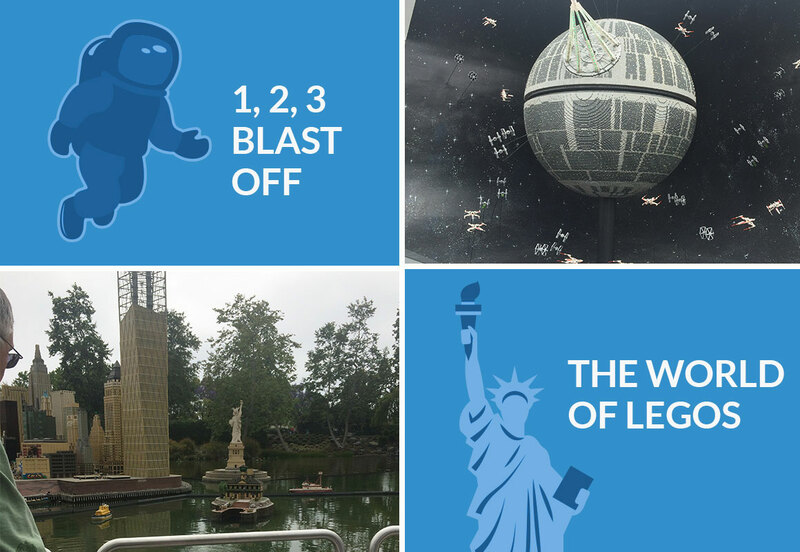 There are tons of great places to take photos—with characters, with all of the amazing structures they’ve built out of Legos, or on the re-created set of the Lego movie. Wear loose clothes, and pack back-ups. The park gets hot, especially with all the running around you’ll undoubtedly do there. So pack a backpack full of extra clothes. I often change my kid halfway through the day if he’s covered in ice cream or hot and sweaty. What can I say? Kids will be kids. If you’re travelling with little ones, get ready for mega fun rides. I didn’t know a lot about Legoland before we went, but the great thing about it that hit me immediately was the amount of activities available for little kids. Compared to other parks, there was no shortage of options. You don’t have to be a certain height to ride all of the rides, and Harry really appreciated that. Have lunch at the Garden Restaurant. The food at Legoland really impressed me. It was healthy, with options like chicken stir fry, make-your-own pastas, grilled sandwiches, and a huge salad bar. They even grow their own herbs in a garden outside. As a result, nobody ends up stuck having to eat something they weren’t in the mood for. The options here are great for people who are health conscious and want to feed their kids real food, instead of all the junk food typically available at theme parks. Stroll through the Lego universes. Even with the rides and interactive options, the coolest area for us was Miniland USA. This part of the park features whole towns built to scale—everywhere from New York City to Washington D.C. to Las Vegas. It also included a Star Wars galaxy with a huge, moving Death Star. It’s definitely not to be missed. Before we knew it, our day at Legoland, California was over. It goes by fast, and keep in mind when planning that the park keeps shorter hours than other parks (for us, it was open 10 a.m. to 6 p.m.). We skipped the water park and aquarium due to time, but we’ll make sure to check them out next time. As long-time Lego fans, my family loved Legoland. It’s childhood brought to life—for boys and girls. Most of the attractions and shows are unisex, so don’t assume anyone will be bored or left out. Great tips! It looks like such a fun and creative place! We’re planning on going to the Legoland near London soon and I’m really looking forward to it. I’m from the San Diego area so hope to also bring my son to the Legoland there at some point when we’re visiting family. So fun! The legoland near us is really not that much to speak of… this one sounds like the real deal!